On the A10 ring road, look for the "Park + Ride lots—labeled "P+R"—to leave your car at the cheapest garages in town and get a free lift into the city center. Three words on driving in Amsterdam: don't drive in Amsterdam. Take it from someone who has attempted to drive in the Canal Zone before: it is definitely not worth the trouble or aggravation. The tight, 17th century streets, broad pedestrian zones, omnipresent one-way systems, and hundreds of little bridges make it a confusing tangle of a mess. It can literally take you half an hour to get from a given point A to a point B that, were you walking, are really only five minutes apart. Also, unless you're used to Dutch bike lanes and laws, you'll come close to killing the legions of local bicyclists approximately five times per block. What's more, driving in Amsterdam is pointless. There is no practially no parking on the streets of central Amsterdam—at all. What little there is is expensive: €5 per hour Monday through Saturday from 9am to midnight and Sunday from noon to midnight. The cheap P + R (Park and Ride) lots near the city's edges. 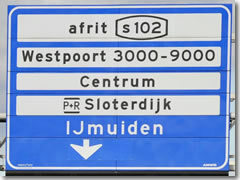 There are eight of these, spaced around the A10 ring-road that encircles Greater Amsterdam. The parking fee at each is a mere €8 for 24 hours, and that includes a public transportation ticket to get into the city center for up to five people. Sweet. What's more, holders of the I Amsterdam Card City Pass get a 50% discount at five of the locations—that's just €4 per day. The only real drawback: you can park for a maximum of 96 hours (four days)—though that is, frankly, long enough for Amsterdam. A garage in the center. There's a huge parking garage under the Museumplein called Q-Park (www.q-park.nl), the most convenient of its 17 locations in Amsterdam. The parking fee is €4 per 52 minutes, €44 per day. There are other garages even farther into the center—all the way to Dam Square—but, again, I urge you to avoid driving within the Canal Zone. It's just a giant headache. For more on driving in Amsterdam: www.bereikbaaramsterdam.nl (in Dutch, but there's a choice to switch languages hidden halfway down the screen's right column). Parking: Q-park.nl, I Amsterdam Card City Pass (discount).